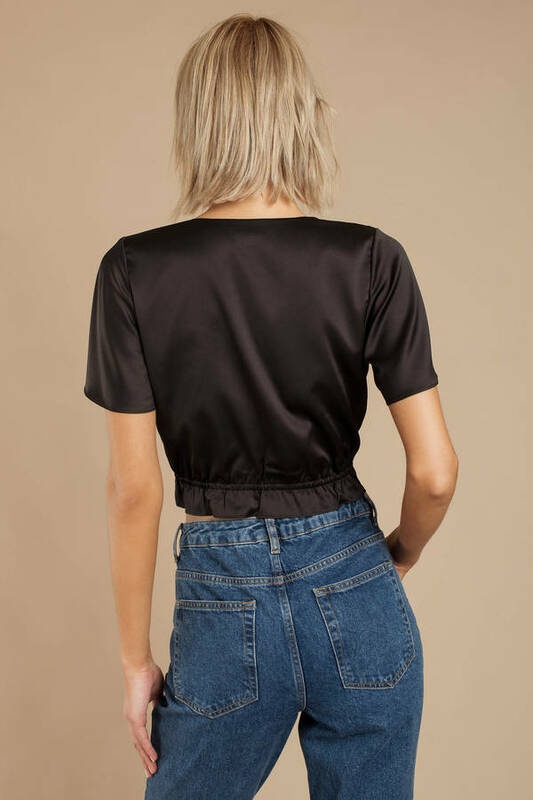 Check out Tobi's Loving It Satin Crop Top Flirt your way through the day in the Loving It Black Satin Crop Top. This tie front top features flowy short sleeves, a mesmerizing plunging neckline, and a front tie to gather it all together. We like to play favorites: the gold top will look fab with faux leather pants and boots. Flirt your way through the day in the Loving It Black Satin Crop Top. This tie front top features flowy short sleeves, a mesmerizing plunging neckline, and a front tie to gather it all together. We like to play favorites: the gold top will look fab with faux leather pants and boots. 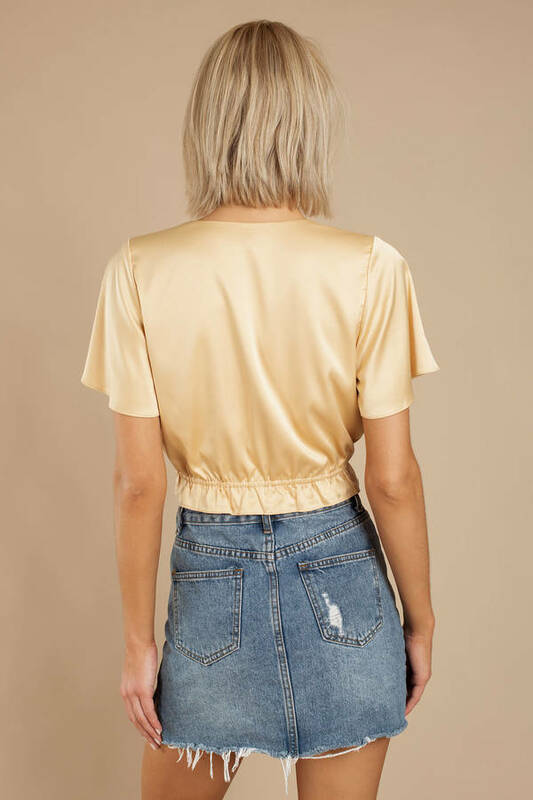 Flirt your way through the day in the Loving It Gold Satin Crop Top. This tie front top features flowy short sleeves, a mesmerizing plunging neckline, and a front tie to gather it all together. We like to play favorites: the gold top will look fab with faux leather pants and boots. 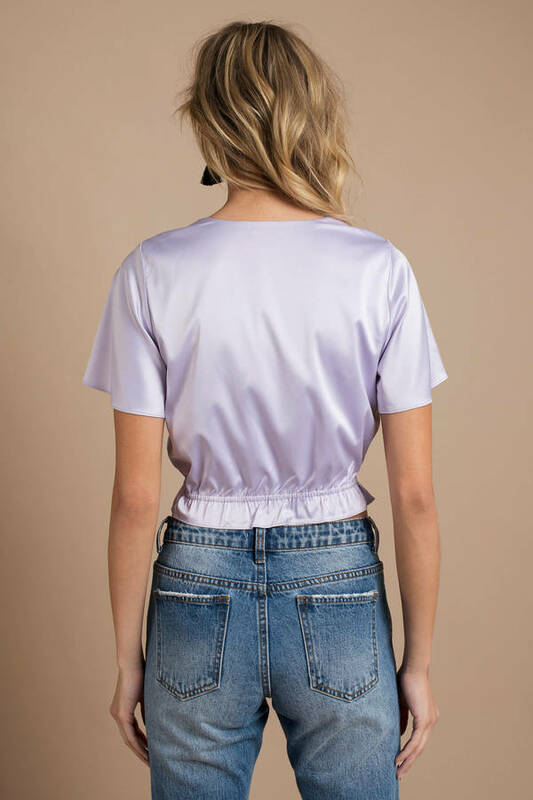 Flirt your way through the day in the Loving It Lavender Satin Crop Top. This tie front top features flowy short sleeves, a mesmerizing plunging neckline, and a front tie to gather it all together. We like to play favorites: the gold top will look fab with faux leather pants and boots.